Anonymous, Advertisement for Burberrys, 1945. Courtesy The Advertising Archives. At the end of the war, the Government-issue 'demob* suit had to suffice for many men, white those who could afford it returned to tailoring firms like Burberrys. Little has changed in terms of style between this example and suits worn before the war. Pleats to the fore, panelled back, three-button fastening to the skirt of this tailleur in check suiting. Self buttons to jacket. In heather, over-checked royal or green. Hips * ■ -j q 36-44 Inches. (18 coupons). 11 J.J."
Anonymous, Advertisement for Harrods, 1940s. Courtesy The Stapleton Collection. Clothing rationing lasted in Britain until 1949. In 1945, 48 coupons per person were issued. Dinner and dance dresses by some of the USA's leading designers, including Hattie Carnegie, Adele Simpson, Nettie Rosenstein and Muriel King. During the war, in the absence of Parisian couture, the domestic industry had started to promote its own designers. Christian Berard (left), 'Bar', from Christian Dior's New Look collection, 1947. Watercolour. Courtesy Archives Christian Dior, Paris. The 'Bar' ensemble was the keynote design of Dior's 'New Look' collection (so called by Carmet Snow, Harper's iiazaar's influential editor), launched in 1947. 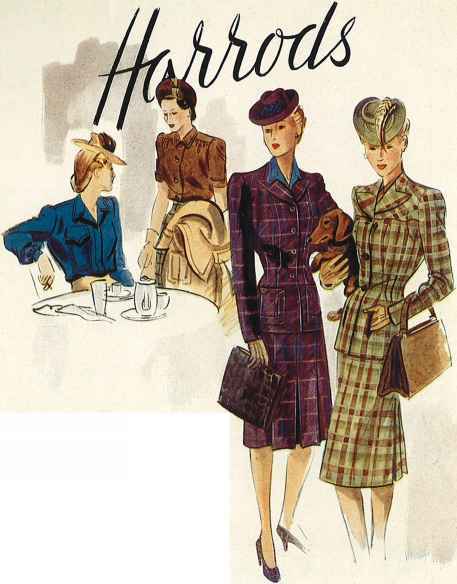 A gently padded jacket with a tiny fitted woist is worn over a full, pleated skirt and balanced by a straw 'coolie' hat. Berard was a close friend of Dior's and advised him on the interior decoration of his first salon at 30 ovenue Montaigne. Photograph of 'Bar', 1947. Courtesy V&A Images/Victoria and Albert Museum. Photographer: Willy Maywald. An example of how a photographed garment can appear to be less appealing than the illustrated version, despite the elegant pose of the model. 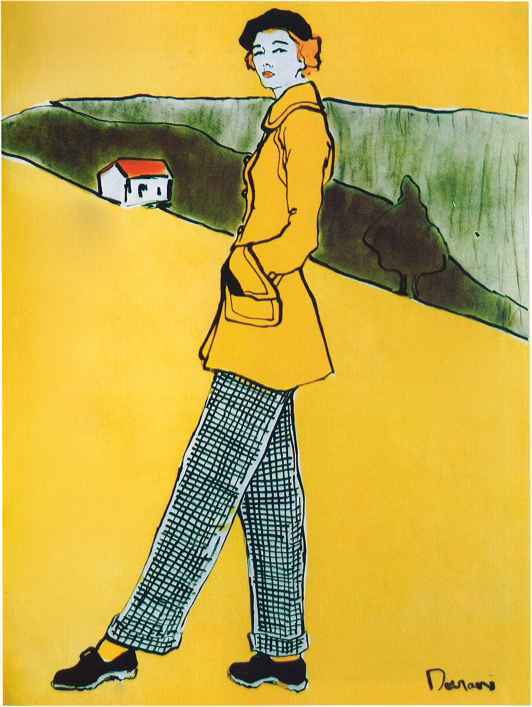 René Gruau, Original illustration of 'Bar' for German Vogue, 1966. Ink and gouache. Courtesy Galerie Bartsch & Chariau, Munich. Twenty years after its creation, Dior's 'Bar' ensemble is given a modern interpretation in Gruau's dynamic drawing and looks as elegant as ever. 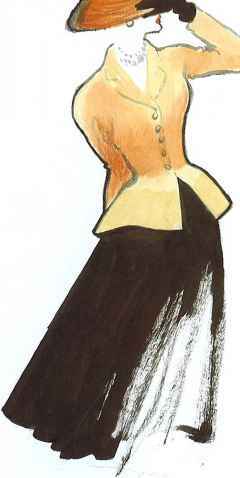 Eric, Original illustration for British Vogue, November 1947. Watercolour. Courtesy Galerie Bartsch & Chariau, Munich. Lucien Lelong's wool suit typifies an alternative, less extravagant silhouette to Dior's New Look, though this does not prevent disparaging glances from bystanders. 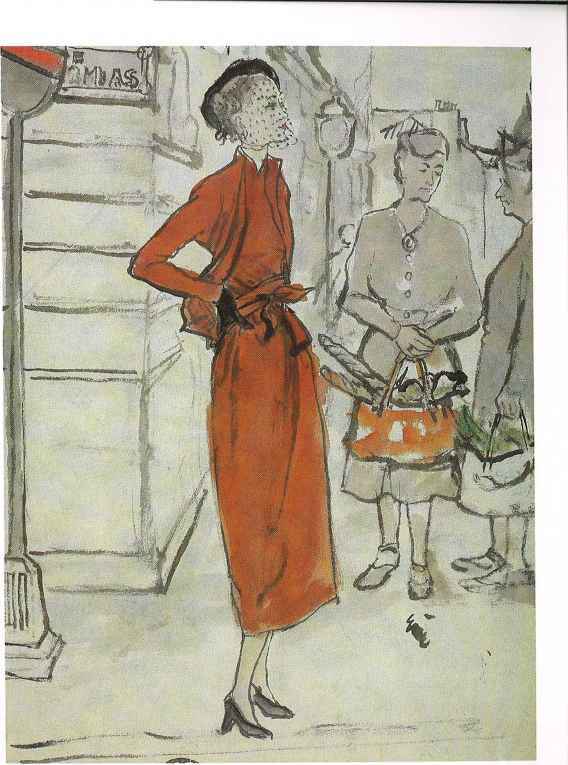 René Gruau, Paris Collections, Woman's Journal, 1947. Courtesy Museum of Costume, Bath. Dior launched a second New Look collection in the autumn of 1947. His models, first and third from left, are shown alongside Lucien Lelong's and Robert Piguet's. Lelong's (second from left) offers an alternative silhouette, with a pencit-thin skirt. Far left—An afternoon dress of soft crepe, whose horizontal print is used with originality to minimise your waist. 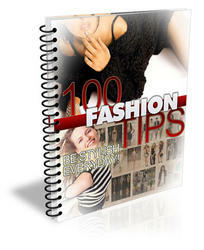 The bodice is caught up in soft folds—the skirt, with its moulded hip line is cnrichcd with a swirl of pleats. Red or navy grounds with grey and white. Hips 35-40. 7 coupons. Anonymous, Harrods summer dresses, 1940s. Courtesy The Stapleton Collection. 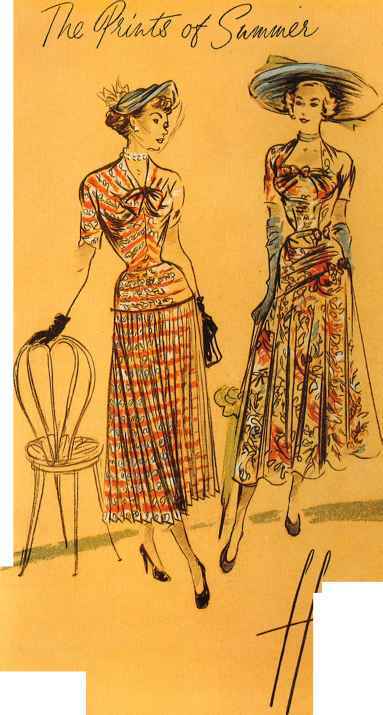 The influence of the New Look can clearly be seen in these printed summer dresses from Harrods, still requiring coupons. 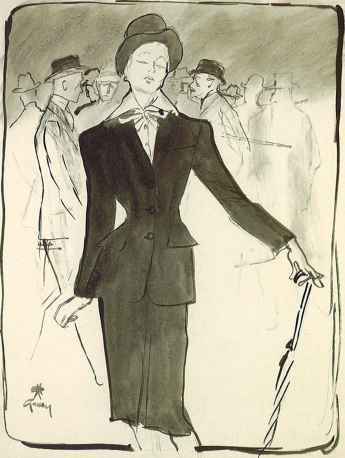 René Gruau, Original illustration of Christian Dior for cover of L'Officiel, October 1948. Brush drawing in ink, watercolour and gouache. Courtesy Galerie Bartsch & Chariau. 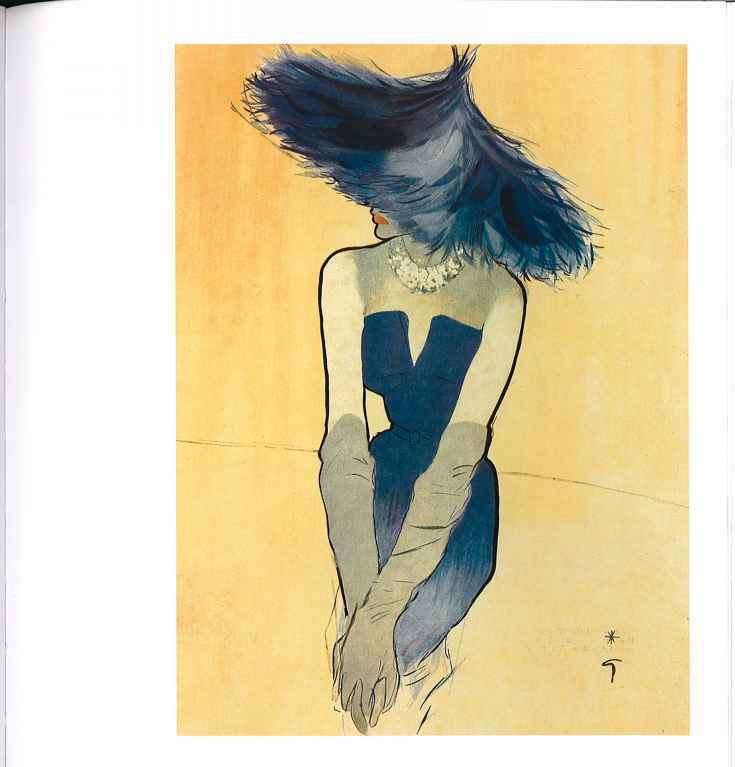 Gruau's work dominates the high-fashion magazines of the 1950s. His decisive, graphic outline always produced a dramatic effect. 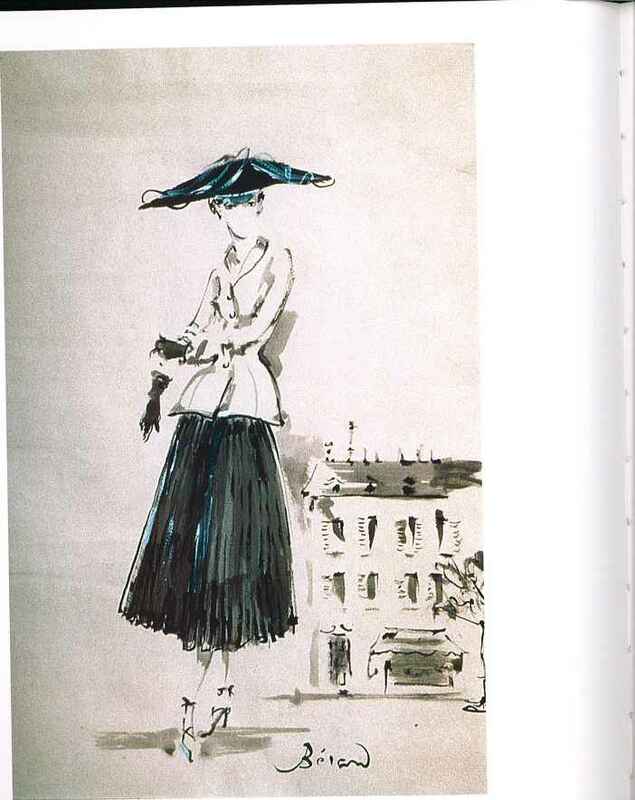 He was Dior's favourite illustrator; their association began before the war when they worked together on the newspaper Le Figaro. René Gruau, Ensemble by Christian Dior, Femina, IV, 1949. Courtesy Museum of Costume, Bath. Dior deplored the demise of the hat, which he attributed to a reaction against those worn during the war. For him, a woman was not properly dressed without one. René Gruau, Original illustration for Adam, 1948/9. Brush drawing and watercolour. Courtesy Galerie Bartsch & Chariau, Munich. in a sharply tailored suit, a model poses with the hauteur that was to become typical of 1950s fashion images. Darani, Madeleine de Rauch, L'Officiel, 1949. Private Collection. An astonishingly modern image - a yellow wool jacket and checked trousers (now entering couture) for weekend wear. 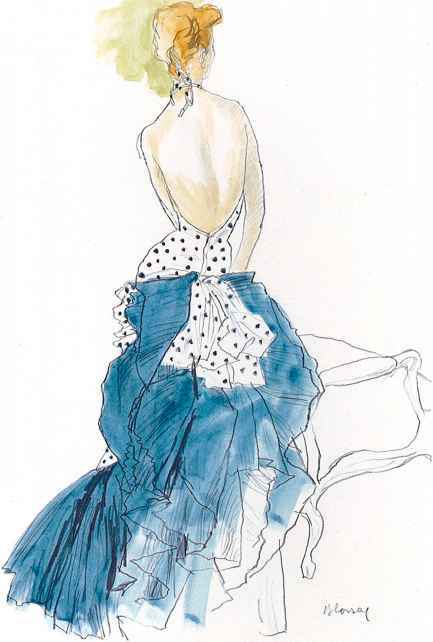 Bernard Blossac, Original illustration of an evening gown by Jacques Fath, c.1949. Pencil and watercolour. Courtesy Galerie Bartsch & Chariau, Munich. The House of Fath, opened in 1937, survived throughout the war. With Dior and Balenciaga, Fath was a major figure in couture through the late 1940s and early 1950s until his untimely death at the age of 42. He was known for his 'occasion' gowns, often featuring large bows and asymmetrical drapery. Bernard Blossac, Original illustration of an evening gown by Jacques Fath, c.1949. Private Collection. Like Gruau and Dior, Blossac and Fath complemented each ) other's work. Blossac's nervous line was the perfect foil for Fath's dynamic designs. Tom Keogh, Costume design tor Gladys Cooper, 1948/50. Ink and watercolour. Courtesy Galerie Bartsch & Chariau, Munich. 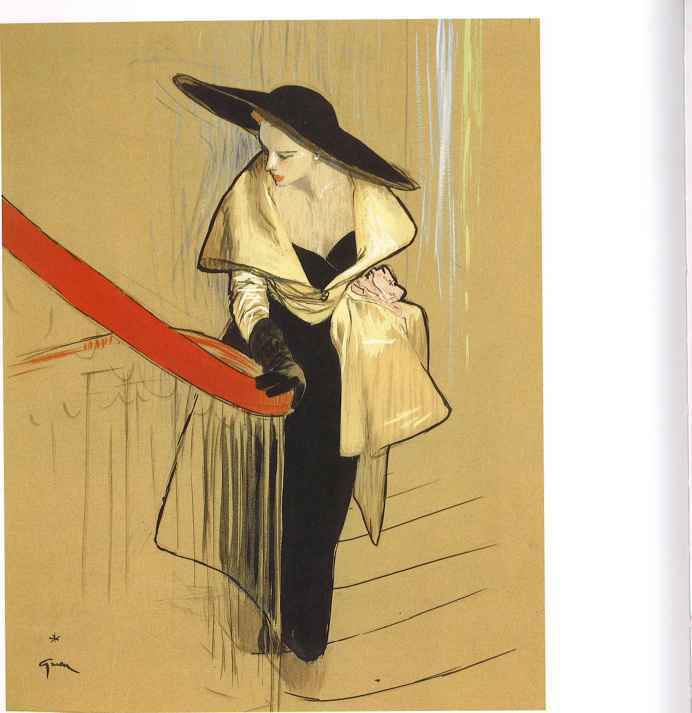 Many illustrators moved effortlessly between the world of fashion and the stage or cinema. Keogh, an American, designed costumes for Marlene Dietrich, Mae West and Gladys Cooper, a major British actress during the 1940s. 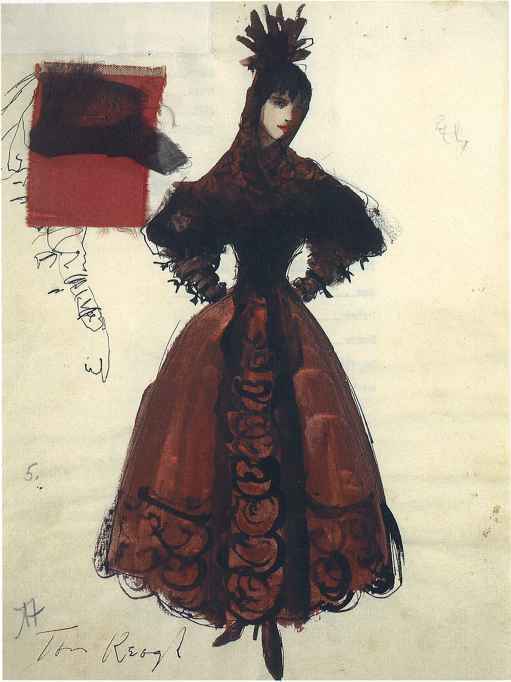 This design may well have been for Cooper's role as Aunt Inez in Vincente Minnelli's film The Pirate, 1948. 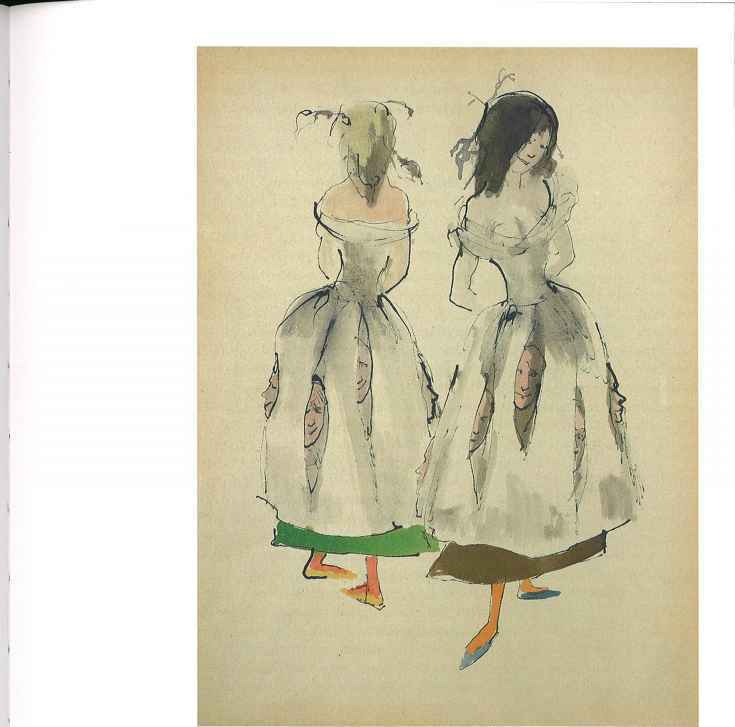 Tom Keogh, Fashion drawing for French Vogue, c.1950. Ink and watercolour. Courtesy Galerie Bartsch & Chariau, Munich. 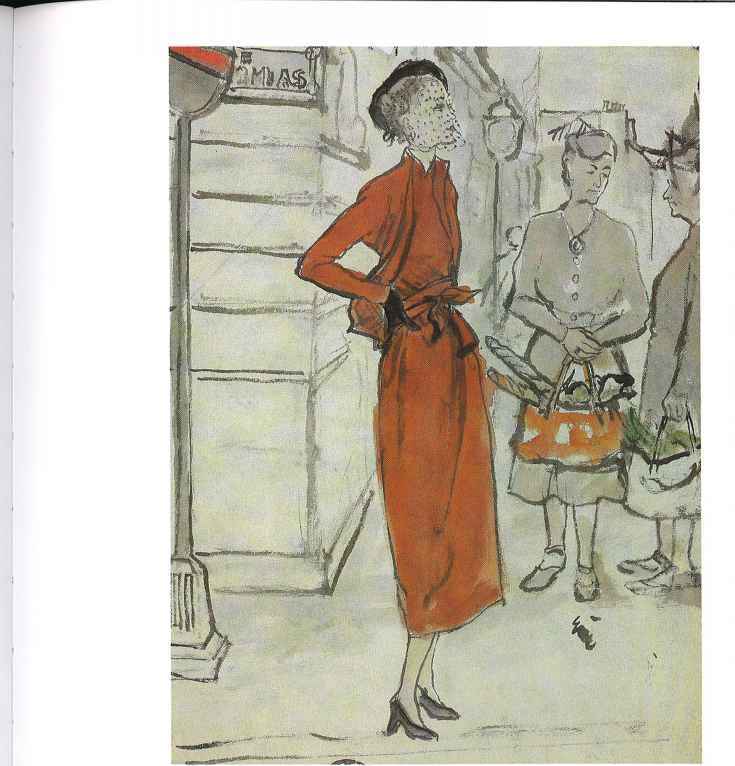 As well as contributing regularly to French Vogue between 1947 and 1951, Keogh illustrated novels written by his wife, Theodora Keogh.